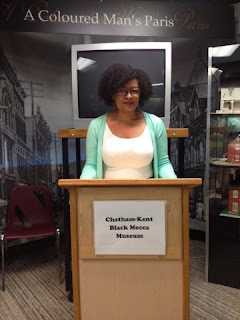 During a recent journey on the Underground Railroad in Chatham-Kent, Ontario, Canada I was impressed with young historian Blair Newby, Executive Director of the Black Mecca Museum. Blair Newby is continuing the tradition of passing down the stories of the freed slaves who settled in Chatham to escape the slavery laws in the U.S. Youth listen to other young people, it is crucially important to support a young woman as Blair Newby who has the capability to motivate the younger generation. She can spark other young people with a desire and a thirst to learn about the rich cultural history of Chatham-Kent. Blair Newby is the first cousin to Artis Lane, a famous Chatham sculptor who has been commissioned by Oprah Winfrey, Michael Jordan and many other celebrities. Artis Lane has sculpted the Sojourner Truth bust located in Emancipation Hall of the Capitol Building. In Washington D.C. The existence of the Black Mecca Museum and its funding are critical to preserving the legacy of Chatham's role and historical significance in the Underground Railroad.